On August 26th 2016, BALI staff, Executive Director Liz Abzug and Program Associate Oriela Baliaj, attended the NY Stock Exchange Opening Bell Ceremony in honor of Women's Equality Day. We at BALI feel honored that American women have our own Bella Abzug (D-NY) to thank for the Women's Equality Day. It was because of her tireless work and dedication to women's equality that the U.S. Congress designated August 26th as the Women's Equality Day in 1971. The day was selected to commemorate the 1920 certification of the 19th Amendment to the Constitution, granting women the right to vote. 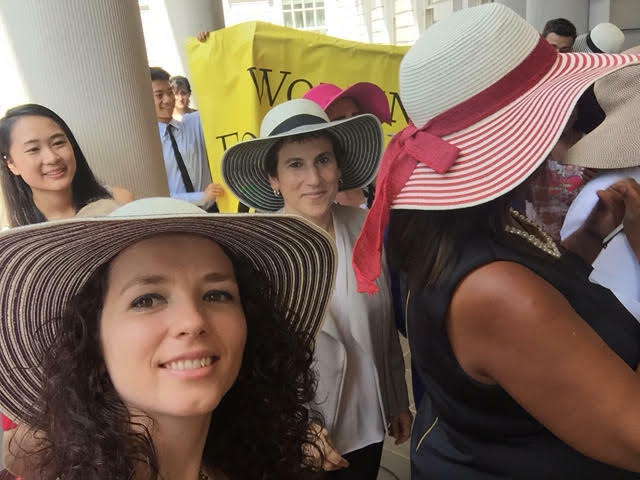 Some of the women who attendeded the Opening Bell ceremony for Women's Equality Day were: NY Congresswoman Carolyn Maloney, NYS Lieutenant Governor Kathleen C.Hochul, Liz Abzug (Daughter of Bella Abzug). 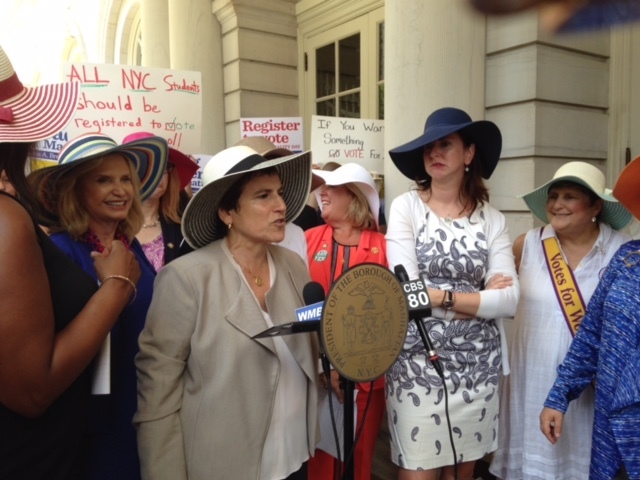 After the Opening Bell ceremony at the NY Stock Exchange, a large group of succesful, powerful NYC women gathered at the stairs of City Hall where Manhattan Borough President Gail Brewer was holding a conference in honor of Bella Abzug to talk about women's status in the US and especially the ERA. She had brought hats (because Bella was known for always wearing a hat in public) for everyone, such a wonderful gesture. Her daughter Liz Abzug, BALI founder and Executive Director, spoke at the event and said: "We need to get a woman elected president, we need to get 50% of Congress to be women, House and Senate, and we really need to elect a woman for mayor and governor in NY as we never had a woman mayor or governor and that is unacceptable" And boy is she right!